Thomas Becket quickly became an internationally renowned saint after he was killed by four of King Henry II’s knights in 1170. Thousands of medieval pilgrims from across Europe made the trip to Canterbury to visit Becket’s tomb and the site of his martyrdom. 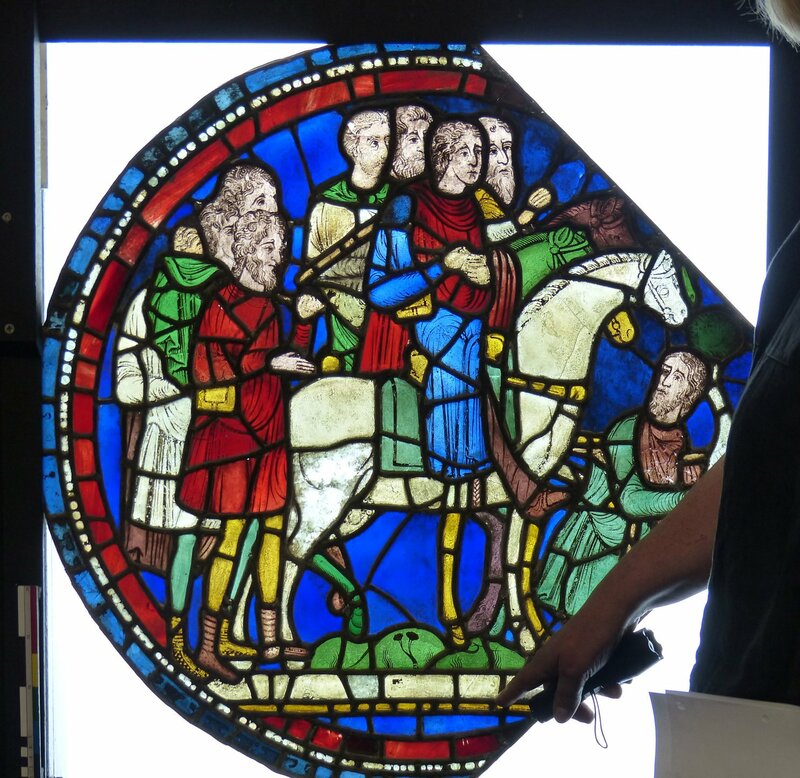 Once the panel was removed from the window, Leonie Seliger, the head of the stained glass conservation studio at Canterbury, examined every individual piece of glass within the panel (over 250 pieces in total) to determine which were medieval originals and which were modern replacements. Due to centuries of exposure to the environment, medieval glass usually shows signs of corrosion and wear. This corrosion can affect the painting of the faces, draperies, and other details, making them appear faded or even blank altogether. The medieval glaziers and modern restorers had different types of glass at hand and utilized different painting styles, so this too helped the team to distinguish medieval glass from modern replacement. Seliger and Koopmans determined that while repairs had been done to the panel, including modern replacements for all but two of the heads of the pilgrims, so much original glass remains that there is no question that the panel was designed and created by medieval glaziers. The medieval pilgrimage to Canterbury is best known today as the inspiration of the Canterbury Tales, Geoffrey Chaucer’s seminal, late-fourteenth century work in Middle English verse. Chaucer’s often bawdy tales and sketches of pilgrims such as the genial Host, the conniving Pardoner, the fussy Prioress, and the Wife of Bath have delighted generations of readers. Illustrated versions of the Canterbury Tales date from in the fifteenth century, including the famed Ellesmere manuscript (a digital reproduction of the manuscript is available on-line), which includes individual portraits of all of the pilgrims and Chaucer himself. The dating of the panel to the mid 1180s was determined by the date the Trinity Chapel construction was completed (ca.1182-84) and stylistic comparisons with stained glass at Canterbury dated ca. 1180. Seliger, who has worked at Canterbury for more than twenty years, termed the discovery of the panel “a tremendous find,” stating “it’s like thinking you had a modern copy of the Mona Lisa, only to discover that you have a real Leonardo da Vinci on your hands.” Koopmans and Seliger plan to continue their investigation into the early stained glass connected to Thomas Becket’s cult at Canterbury Cathedral in the years to come.